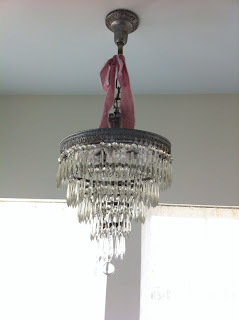 Well I spent some time today making curtains for my bathroom............a project long overdue. 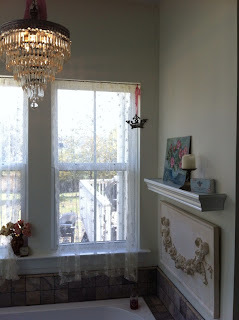 I had just bought some Rachel Ashwell fabric, vanilla lace, to do them in..............I love it....I have the bedskirt that matches in my bedroom............They do not show up so well on my photos but I posted them anyway! lol.............................The chandelier has hung in the bathroom since we build the house 2 years ago..........a great Ebay find!.............I have tied some ribbon around the top that I made out of pretty silk velvet....also from the Rachel Ashwell collection............it adds that little bit of shabby chic pink!